Well, I’m single this Valentine’s Day, but I’m going to a housewarming for a really lovely couple, so I decided to bring something a little romantic: a bouquet in pie form. This is a rose water cream pie from The Best of Shaker Cooking…topped with candied fresh edible flowers. Sorry there are no roses – not only did they not have organic roses at Fairway, but I’m kind of just not a huge fan of roses. Don’t get me wrong, they’re gorgeous and I’d never say no to a heartfelt dozen, but I tend to feel the red ones we usually see kind of lack personality. Or maybe I was just scarred by the episodes of Buffy where Angel turns evil and leaves roses to freak people out. 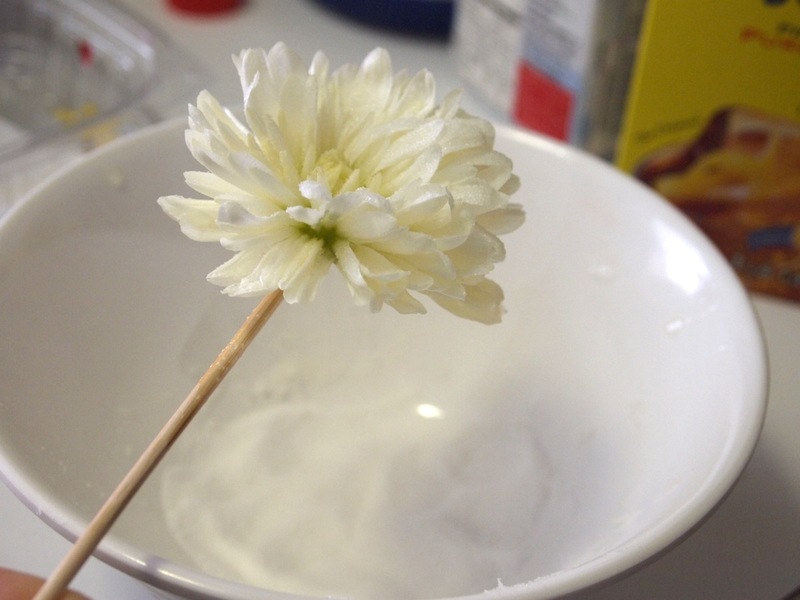 To candy flowers you first coat them entirely in egg white. Then you sprinkle them with superfine sugar until they’re coated and the egg white is absorbed. Then just let them set in a warm, dry place for about 24 hours. If your house isn’t warm and dry (mine is bone-dry right now from radiator heat and was perfect), try putting them in a really low-temperature oven with the door cracked open for a couple of hours. One other thing: use egg whites from a carton: they’re pasteurized, and they’re usually kind of watery – the more solid part of the white is nicely broken up. 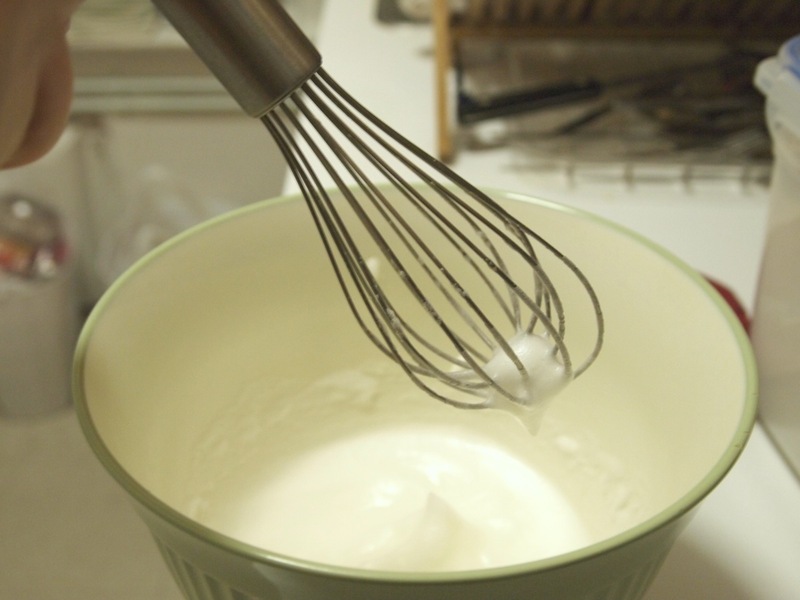 If you use fresh whites, make sure they’re pasteurized and whisk them a bit to break everything down before using them. I did these flowers in advance, and was planning on making the pie the morning of the party. The night before, though, I got woken at 3 a.m. by drunk people pouring out of the bar down the street. Since I was completely unable to get back to sleep, I decided to make pie. Crust was already taken care of: I whipped up a half-batch of my favorite Cook’s Illustrated vodka pie crust the day before yesterday. 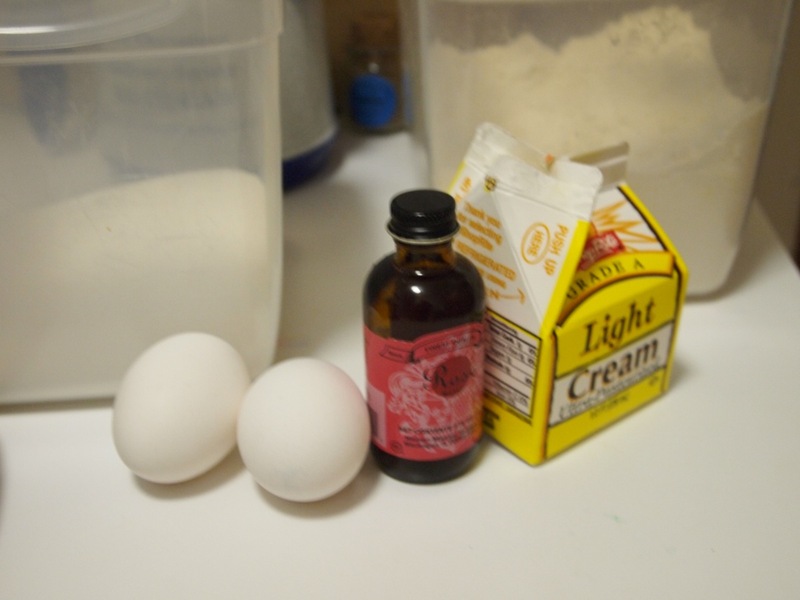 The ingredients for the pie itself are really simple: just eggs, flour, sugar, cream, and rose water. The tough part: I didn’t want to run my mixer and wake my roommate, so I had to beat egg whites by hand. I felt like I was in the relay challenge from Top Chef: Just Desserts. But even without a copper bowl I eventually reached stiff, shiny peaks…and a very sore wrist. The pie came off without a hitch, and I baked it, as the recipe told me to, until “golden on top like an angel.” The whole time I tiptoed around the kitchen I felt like I was in one of my favorite childhood books: In the Night Kitchen. Don’t worry – I didn’t shuck off my clothes and swim in the pie filling. This time. 1. Preheat the oven to 375 degrees. Roll your crust out, place it in the pie tin, prick the bottom with a fork, and blind bake it: cook it for 10 minutes covered with foil and pie weights in, remove the foil and weights and bake for 5 minutes more. 2. In the meantime, heat the cream until just above room temperature. Whisk the flour, sugar, and salt together with a fork, add them to the cream, and mix until the sugar is dissolved. 3. Beat the egg whites until stiff and shiny, then fold them into the cream as gently as possible: there should still be some floating “rafts” of egg white as you pour the filling into the crust. 4. Bake for 10 minutes at 375, then reduce the heat to 325 and bake for another 50 minutes or so until the pie is mostly set – it should be golden brown on top, and should only jiggle in the middle. If it’s Valentine’s Day weekend and you’re feeling cheesy, decorate it with candied flowers and snuggle up to it! I love your reference to Buffy!! I remember those episodes too, haha. 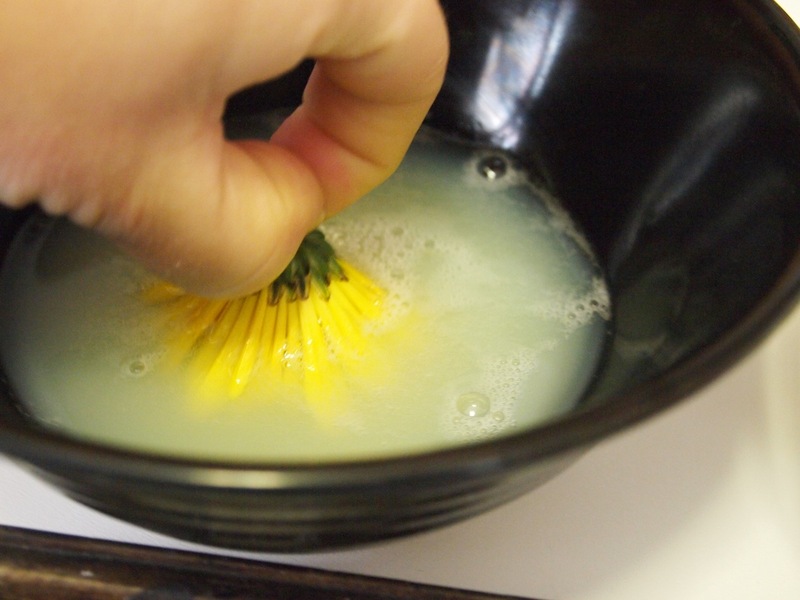 Love the idea of candying flowers. I’ve candied mint leaves before, but never flowers. This pie is such a great idea for this (horrible) time of year 🙂 Happy single awareness day, haha. Beating egg whites by hand is hard! Good job on that. 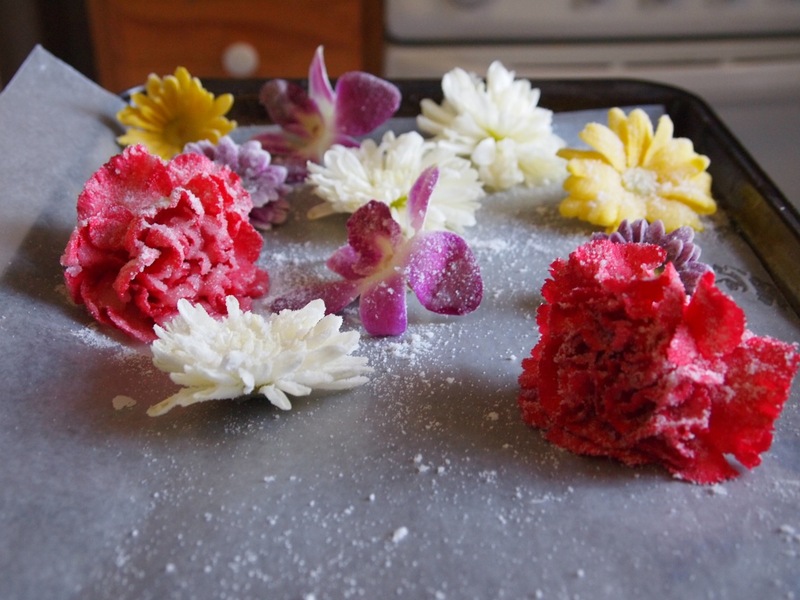 That candied flowers look great – such a good idea! Oh wow..looks so cute and beautiful! Gorgeous! I’ve always wanted to candy flowers, but I’m scared I’ll get something poisonous! this looks fabulous. thanks for sharing! i never knew you could make flowers edible!! The candied flowers look beautiful! Well done for not buying the roses they hike the prices up ridiculously for the unimaginative at this time of year!! Truly lovely in every sense of the word! The recipient will enjoy this sweet gesture. Terrific tips on the candy process for flowers – gorgeous gems, every single one, Brava! What a fabulous garnish…thanks for the step by step instructions!! Wow I had never thought of making candied flowers for a garnish. Thanks for the tips! Two thumbs up! This is highly impressive! I totally agree with the roses thing. Flowers are being grown like factory cows these days. My Mum would cut flowers from our garden in the late spring and summer and these were gorgeous – especially the sweet peas! but we never bought or received flowers from a store. guess it’s employing a lot of people but it seems wrong, like eating those california strawberries all year that have no taste. Um, if Bob is reading this I can make exceptions to this (it’s our anniversary today – but he gives me daffodils which is seasonal, right?